If you want to paint with an extremely broad brush, you can think of the last twenty years of analytical advances in baseball as waves, alternately benefiting hitters and pitchers. First came the Moneyball years, when sabermetric advances brought offense into the game. It wasn’t just that teams started playing more beefy guys who could hit for power and take a walk. They also encouraged their existing players to be more patient — that’s how you got the iconic four-hour Yankees-Red Sox games of the mid-2000s, in which both teams seemed to make a personal challenge out of who could take more pitches. This coincided with the beginning of the end of the sacrifice bunt, yet another boost to offense. If it first seemed like every analytical advance increased offense, however, the tables quickly turned. First the Rays realized that newly offense-minded front offices were undervaluing defense. Then they turned to infield shifts. Before long, the Pirates were using data to optimize pitch selection and every team was hunting high and low for pitch framing. If the early 2000s were all about using math to find better ways to hit, 2008 to 2014 was about using data to strangle offense from every angle. Things have started moving more quickly since then. Batters reacted by trying to lift the ball more, helped out by a livelier baseball. Pitchers tried throwing higher in the zone to counter that, and at the same time teams started working with pitchers to tailor arsenals to their innate spin rates and pitch shapes. It’s not stopping here — batters are going to work to counter pitchers’ new arsenals, and defenses are going to work to find new and better shifts. For all this back and forth though, I think that the long game favors pitching. The reason is that, to my mind, batting is a game of picking on weaknesses. Teams don’t get their offense against the aces and the tough part of the bullpen, or in lefty-lefty matchups. They pick on tiring pitchers, righties pitching to lefties, or relievers pitching their third game in three days. It’s always been this way — offense spikes in expansion years when the pitching pool gets diluted, and the times-through-the-order penalty has always existed. If that’s where offense has always been generated, however, then batters are in trouble. Pitching staffs across baseball are shoring up weak points like never before, and there’s not much offenses can do about it aside from just hit better. It’s still April, but it’s almost a guarantee that two pitching trends are going to reach all-time extremes this year. You’ve probably heard of the first one: starters will face batting orders for a third or fourth time less than ever before. The second one is more subtle, but it’s affecting offense just the same. So far in 2019, batters have faced opposite-handed pitching only 51% of the time, a record low. Jason Heyward was a very good baseball player for a very long time. From 2010-2015, his 25 WAR was one of the top 20 marks in the game and in his final two seasons before free agency, his 10 wins was 10th in all of baseball. In his one season in St. Louis, Jason Heyward was worth 5.6 WAR. In three-plus seasons for Chicago, Heyward has been worth 4.6 WAR as he approaches the midway point of his $184 million contract. To say the contract hasn’t worked out ignores that the Cubs won a World Series in his first season with the club and have won 90+ games in the two subsequent seasons. 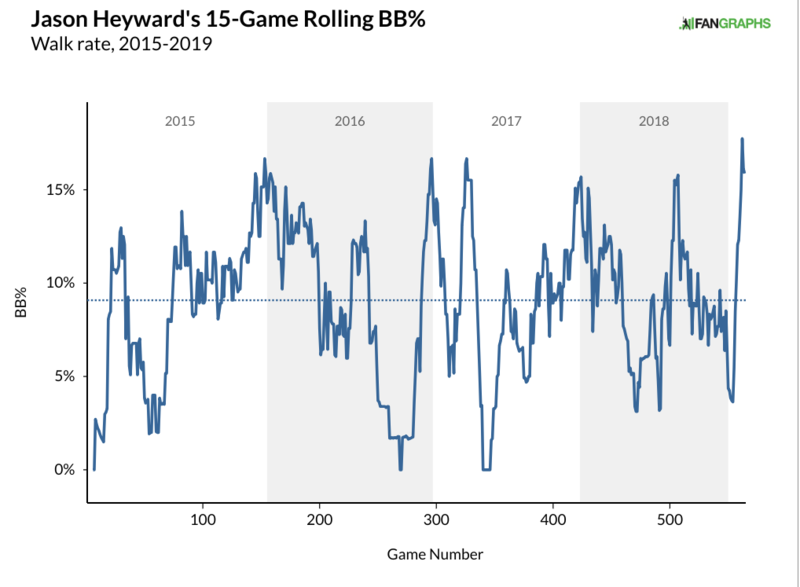 Heyward hasn’t been a good value early on, but he trended upward slightly last season, hitting at an average level and producing at a above-average level overall when factoring in baserunning and defense. This season, Heyward has been one of the better hitters in baseball in the early going thanks to an a absurd 10 walks compared to just six strikeouts as well as new secret trick: hitting the ball hard. We probably don’t need to go through all of Heyward’s history, but the table below shows that in his final year before joining the Cubs, Heyward hit the ball relatively hard and often on the ground while with the Cubs, Heyward got the ball in the air more, but hit the ball with less authority. This season, Heyward is off to a great start with a 165 wRC+; his average launch angle is 18 degrees and his exit velocity thus far is 90.5 mph, per Baseball Savant. 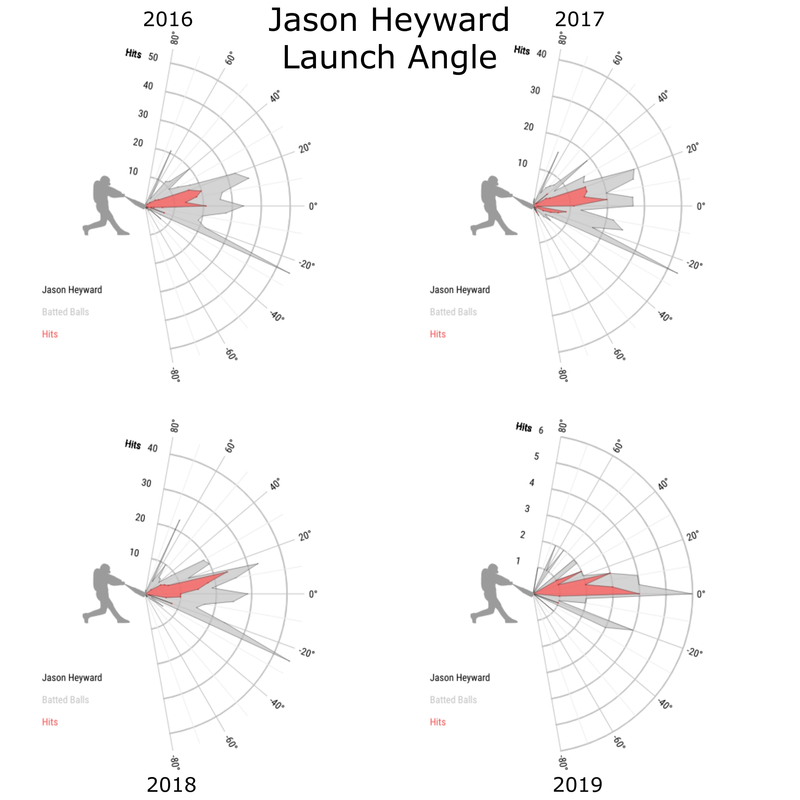 When we talked about the launch angle revolution and trying to get players who hit the ball hard on the ground to put the ball in the air more, Jason Heyward was a prime example of a player who might benefit. Heyward hit the ball pretty hard with the Cardinals, and most of the time it went on the ground. His ISO wasn’t anything superlative, but he hit the ball hard enough to make himself an above-average offensive player. Heyward did have the one year in 2012 when he hit 27 homers, but that has become an anomaly as his career has progressed. In the first 15 games this season, Heyward has a .255 ISO. 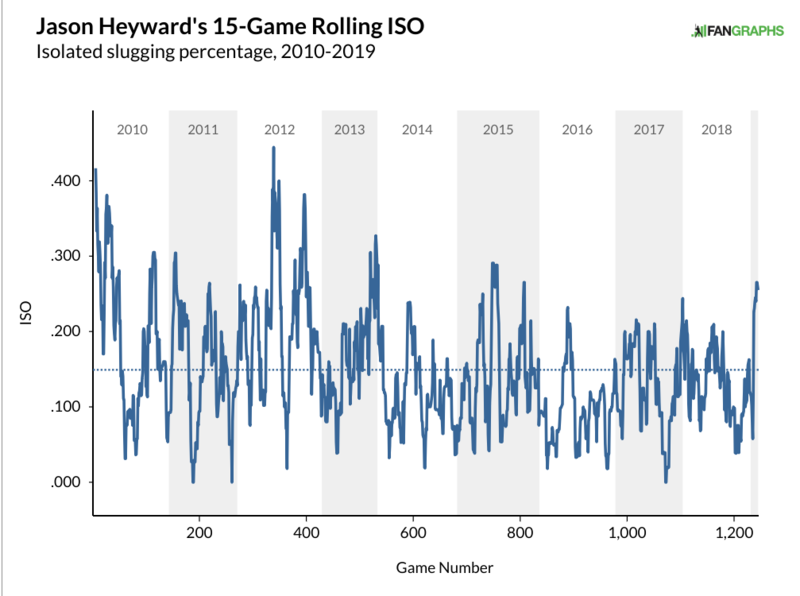 Look at this 15-game rolling ISO chart and try to spot the places where Heyward has ever hit with this much power, even in a small sample. There’s literally no 15-game period with the Cubs in which he’s hit for this much power. He had one, maybe two brief stretches with the Cardinals, he closed the 2013 season well, and had a handful of hot periods during the first three seasons of his career. Since the end of the 2013 season, a period now encompassing more than five seasons, Heyward has had a short stretch like this just a couple of times. His career ISO is .149; the league has averaged an ISO of .151 over that span. Heyward has been, at best, an average power hitter, and over the last few years, he’s been well below. That makes what he has done unusual so far. Of his five extra base hits this season, four have been homers; if a couple of those homers had been doubles, we’d be looking at something more reasonable, though Heyward’s .367 xwOBA indicates he’s still been hitting the ball well, regardless of how many balls have gone over the fence. What’s even more striking than Heyward’s power output is his discipline. Heyward has walked in 10 of his 63 plate appearances and struck out just six times. He has long been a player who has walked a lot while striking out at a rate better than league average, but this walk rate is one unseen since before his 2015 in St. Louis. Heyward’s changes in walks and strikeouts are fueled, perhaps unsurprisingly, by swinging at fewer pitches outside the zone and more pitches in the zone. As he has swung at more pitches in the zone, he’s making contact on more of those pitches as well. One notable part of the graph above is the contact percentage out of the zone. While Heyward has swung at considerably fewer pitches outside the strike zone, he’s missed on those swings at a higher rate. This might suggest that those pitches outside the zone aren’t pitches that are close resulting in weak contact, but rather are pitches where he is actually fooled. Given that his contact rate in the zone has gone up, it’s possible Heyward is simply swinging a bit harder, or more comfortably, at pitches he feels he can drive. That brings us back to launch angle. Looking purely at average launch angle can be a bit deceiving at times. As the table at the beginning of the post indicates, Heyward did a better job of getting the ball in the air, but he was a much worse hitter. Launch angle charts can help provide some insight into why. First, look at this chart from Heyward’s year in St. Louis, from Baseball Savant. That huge needle at -25 degrees represents a ton of ground balls that resulted in basically no hits. Then we see a bunch more batted balls from negative 20 degrees though positive 25 degrees with a decent number of hits. Then we see a tiny blip at 40 degrees and another small one at around 60 degrees, basically representing infield fly balls. Heyward was successful above because he hit the ball hard. The graphs below show the Cubs years when Heyward got the ball in the air a little more, but didn’t hit it hard and got poor results. From 2016 through 2018, there is a massive spike at negative 25 degrees and a lot more negative numbers. There are a few more balls between zero and 20 degrees compared to what we saw in 2015, but not measurably so. 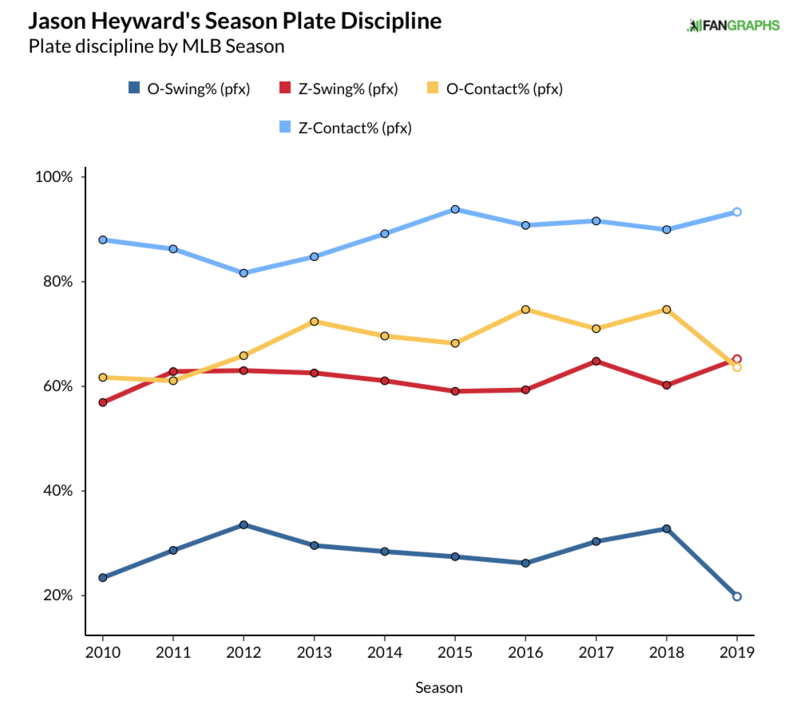 We then see an uptick at the higher levels when Heyward was popping balls up; his infield fly percentage was over 18% in each of the past two years, the worst in the majors among the 165 batters with at least 900 plate appearances. Exchanging a few ground balls for infield flies might be a good way to see your average launch angle rise, but it doesn’t make for a better hitter. It is very early, but Heyward isn’t hitting as many ground balls or infield flies, instead hitting balls much more likely to land for hits or home runs. It’s possible what we are seeing is just a blip and Heyward will revert back to the average hitter he was last year, or regress further. It’s also possible that among all of Heyward’s hitting tweaks over the last decade and improved health, he’s finally found something that can turn his hard-hitting ground ball tendencies into a launch angle converted power hitter. 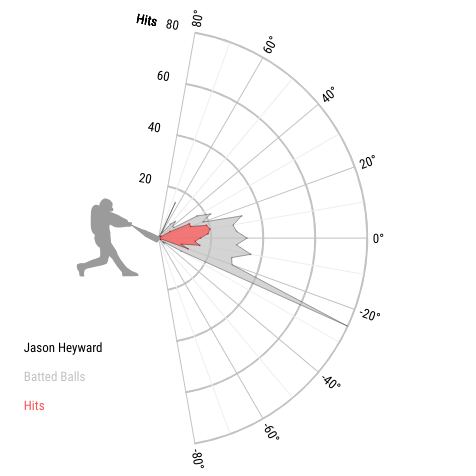 The Cubs tried to tap into Heyward’s power when he first arrived by changing his swing, but a swing designed to turn on inside pitches plus a wrist injury just made Heyward a poor hitter. He has slowly improved the last few seasons, and he’s off to a great start this year. He’s finally hitting the ball hard, again, and if he can keep putting the ball in the air on strikes in the zone, he just might hit well enough to make opting out of his four years and $86 million a consideration instead of a complete non-starter. After two middling starts to kick off his season, Thorpe was dominant yesterday and K’d 12 of the 22 hitters he faced, all on either a fastball at the letters or with a curveball beneath the strike zone. He has quite the injury history (including a two-year stretch where he didn’t pitch at all) and it has impact on how the industry perceives him, which is why he’ll be ranked a bit beneath where he would otherwise be based on his stuff and proximity to the majors. But Thorpe has been consistently healthy since May of 2017, which may begin to allay concerns. The Dodgers have done well drafting and developing college power/speed hitters who are athletically stiff, have some swing and miss issues, or both. Thomas, who will be an interesting Rule 5 case this offseason, is one of these. He’s striking out a lot as a 24-year-old at Double-A, but some teams may view the context of his performance differently because Thomas was a two-sport college athlete who hasn’t focused on baseball for as long as other prospects his age. The Dodgers will need to add several other players from Thomas’ draft class to the 40-man (Will Smith, Mitch White, Jordan Sheffield, Tony Gonsolin), so Thomas would seem to be a candidate for trade if a team loves the tools, ability to lift the baseball, and has some 40-man space/time to spare to let him develop further. Cleveland outfielders, aside from Leonys Martin, are struggling right now. Mercado has begun to heat up at Triple-A with hits in five consecutive games. If he starts seeing more time in a corner, it may be an indication a call-up is imminent, because he’s not supplanting Martin in Cleveland’s center field. He’s only started 23 games in either left or right field during his career, and it might behoove Cleveland to get him more acclimated. The Hosmer and Machado deals almost certainly make France a burgeoning trade chip. He’s exactly the kind of hitter to whom the PCL is extra nice, but he’s hit at every level since college and, save for one season, has also hit for power, and his current SLG% is more caricature than mirage. France also had a great spring with the big league club and is on the 40-man, so he’s likely to debut this year if one of the big league corner bats gets hurt, though San Diego might view that as a way to clear their outfield logjam by playing Wil Myers in the infield again. A quintessential Houston four-seam/curveball pitching prospect, Ivey at least projects as a good multi-inning reliever and his four-pitch mix gives him a great chance to start. He was ejected two innings into his last start for having a foreign substance on his glove. He’s a sleeper 2020 Top 100 candidate. There’s background on Cavaco in yesterday’s Notes. I saw him again yesterday against Torrey Pines High School and he had a tough day at the plate, swinging over multiple changeups from TPH’s funky lefty starter. There are going to be questions about his hit tool because of both the swing (inconsistent, arguably ineffectual stride length, odd hand path) and his lack of track record against elite high school pitching, and maybe about what his ultimate defensive position will be, but he’ll be somebody’s toolsy sandwich round pick. Also of note from the game was Torrey Pines CF Mac Bingham, a 2019 committed to USC. He’s a strong, compact 5-foot-10, 185, and was the football team’s running back in the fall. He made strong contact with two hittable pitches, and ran a 55 time from home to first while legging out a double. The frame makes the power projection less exciting and one area scout told me the general consensus is that Bingham will go to school, but he’s at least an interesting, tools-based follow for 2022 if he does. The Philadelphia Phillies are off to a more-than-reasonable start in 2019, standing at 11-6 and currently in first place in the NL East. In the early weeks of the season, the division has been as tight as expected, with only 2.5 games separating the four teams that had a reasonable preseason claim to 2019 relevance. What’s unexpected about Philadelphia’s early lead is that it has little to do with the performance of their ace pitcher, and 2018’s third-place finisher in NL Cy Young voting, Aaron Nola. Nola has thrown four starts so far this season and has been terrible in three of them, all losses. Even more damaging is that all four starts have been against the NL East competition, meaning every loss in those games is a guaranteed win for the team’s direct rivals, no scoreboard-watching needed. Add it all together and you have a pitcher who is already nearly a third of the way to what would be his career-high for home runs allowed in a season, with a 7.45 ERA and a walk rate double what he posted in 2018. So what’s happening with Nola? The obvious thing to do is to look is at his miserable walk and home run rates, and see if there’s any chance he’s not getting what he “deserves” from his pitching. For a quick look at a pitcher’s walk rate, you can actually make a simple model that estimates that rate knowing just his plate discipline numbers. Knowing just that, you can get a surprisingly adequate estimation of what a walk rate “should” be. In this case, my very basic non-linear model with observations weighted by number of batters faced, gets the r-squared to 0.65. In layman’s terms, that means that approximately 65% of the pitcher-to-pitcher variance in walk rate is explained by the pitcher-to-pitcher variance of the inputs. That’s a pitcher who’s largely earning a poor walk rate. One might think that Zone% is the a key statistics here, but it’s actually not; first-pitch strikes and swing percentages are far more relevant when predicting walk rate, with the r-squared for Zone% by itself only being 0.05. For the other two variables, it’s 0.41 and 0.29, respectively. Nola’s not throwing first-pitch strikes and batters are not swinging at his stuff at the usual rate. And when they do swing, especially at out-of-zone pitches, they’ve been far more likely to make contact than in the past. At a cursory glance, batters are taking a more patient approach with Nola, waiting him out, and largely getting the pitches they want. This number tends to stabilize fairly quickly (52% of pitchers with at least 10 innings pitched are already within two percentage points of their actual walk rate), so it’s a statistic I tend to use when deciding whether to panic about a pitcher’s early walk rate. Since someone will no doubt ask, here are the top 10 departures from expected walk rate so far in 2019 (both good and bad). A simple look at Statcast also suggests that Nola’s getting hit a lot harder than in the past. His average exit velocity has jumped from 85.9 mph to 90.0 mph and his barrel-percentage has doubled. The algorithms of Willman, Petriello & Friends predict that a player with Nola’s profile ought to be allowing a .490 slugging percentage; hitters are actually slugging .533 against Nola. So while one can say he’s getting hit a little harder than expected, you still don’t want any of your starting pitchers to be that crushable. In 2018, only a single qualifying pitcher allowed a slugging percentage worse than .490: Dylan Bundy at .523, with a shocking difference between him and Jakob Junis in second place at .455. So why is it happening? That’s a tricky question, in that there’s no giant red flag, no significant dip in velocity or worsened movement on his pitches. You can see a lot of what’s going on with that first-pitch strike percentage, which shows a troubling difference from 2018. Last year, batters swung at 29% of Nola’s first pitches, whiffing on 28% of those swings. This year, those numbers are 18% and 19%. 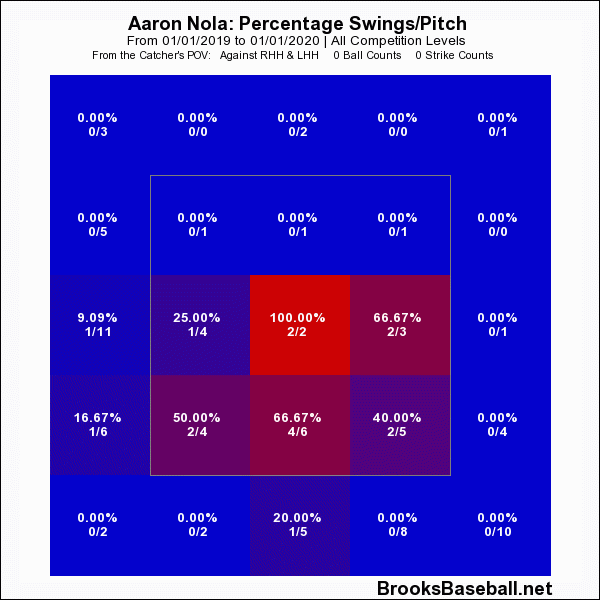 Nola’s started off 32 plate appearances this year throwing a curveball and he’s gotten a swing-and-miss on…zero. It’s a similar story with his fastball. 27% of his first-pitch fastballs resulted in a 1-0 count last year. This year, that number is 55%. From this graphic, Nola’s thrown 60 pitches outside the strike zone on 0-0. Batters have swung at only three of them. At least in the early going, batters seem to simply be taking a more passive approach to Nola after his breakout 2018 season, and he hasn’t adjusted. And he’s getting away from some of the things that he did successfully in 2018, such as daring to throw curves to lefties when behind in the count (he’s dropped from 39% to 20%). Batters are more patient and Nola’s been more predictable. With the division expected to remain a tight race, every loss is of enormous consequence. ZiPS estimates that Nola’s four starts, when you combine what he’s already done and the decline in his projection, will eventually cost the Phillies 1.2 wins from their preseason forecast. To get an idea what this costs the Phillies in terms of their October fate, I set ZiPS to project the Phillies with Nola performing as predicted before the season (3.9 WAR prorated over the remaining games) and how Nola is predicted to perform now (3.4 WAR), along with a few worse projections, based on how long it takes Nola to get back to where he should be. The Phillies are surviving so far without Nola in top form, but the longer it lasts, the more damaging it becomes to the team’s playoff hopes. It’s not time for Philadelphia to panic about their star pitcher, but with it unlikely that there’s a pitcher equally as good available for trade, it’s time to mix in some serious concern with the cheesesteaks. Yesterday, I took readers on a tour through small sample theater to examine the extreme and anomalous performances produced by hitters thus far, nearly all of which will come out in the wash as time goes on. Beyond strikeout, groundball, and fly ball rates, all of which stabilize at the 70 batters faced mark, pitching lines may contain all sorts of oddities. Whether you’re going by actual runs allowed or focusing on defense-independent outcomes, 25-year-old White Sox righty Reynaldo Lopez entered Wednesday as the worst of the majors’ 83 qualified starters in both ERA and FIP; he was surpassed in the former category by the Angels’ Matt Harvey (9.64 ERA) as the count of qualifiers increased to 93 on Wednesday, but the No Longer Dark Knight’s just not as interesting as Lopez at the moment. Looking at Lopez’s raw rate stats, it’s not hard to understand why his run prevention has been so shoddy: he’s combining a below-average strikeout rate (17.5%) with a hefty walk rate (14.4%) and an astronomical 3.26 home runs per nine. To throw some gasoline on the fire, there’s also his .345 BABIP, the result of a lot of hard-hit balls; his average exit velocity of 92.7 mph ranks in the seventh percentile, and his .394 xwOBA in the 13th percentile. Ranked 28th on our Top 100 Prospects List heading into 2017 on the strength of a plus-plus fastball and a plus curve, Lopez was pretty serviceable last year (3.91 ERA, 4.63 FIP, and 2.2 WAR in 188.2 innings), but right now, he’s not fooling many hitters; his 21.2% outside-the-zone swing rate is down seven points from last year, while his 89.9% zone contact rate is up four points. Corbin Burnes: Do I have a Home Run Problem? stever20: What do you make of Chris Sale? His career in April normally is pretty good(before this year 2.82 ERA). So it’s not like he normally starts slowly. Even brought in his personal catcher and that didn’t help. Jay Jaffe: I’m more worried about Sale with each passing start, but I think it really comes down to a lack of arm strength brought about by a slow build up this winter. He’s just not the same pitcher if he can’t get his velocity up to where it normally lives, and right now, his fastball is getting tattooed for a 1.095 SLG and a 322 wRC+ (also in today’s forthcoming piece). Rather than sending him out there every fifth day, I do think the Red Sox should DL him and send him back to extended spring training to ramp up, because he’s not helping them by getting hammered each time out. Tel: What’s the deal with the playoff odds graphs? The Yankees beat the Red Sox 8-0 on Tuesday and their playoff odds went down from 91.1% to 84.4%? The Red Sox went up from 52.8% to 54.4% or so yesterday but this morning are back to 50.7% in the odds numbers dated yesterday. I know things change based on playing time estimates etc., but what’s the point of a graph if you can’t gloat over your team crushing their rival and moving the needle on the odds? Seems like if you’re putting up a graph the changes should be based on how the team is playing rather than how Fangraphs staff changed the team’s playing time estimates. Being a fan of a rebuilding team is a tricky line to walk. You want the players to do well, obviously — you’re watching them every day, after all, and it’s only human to root for what you’re watching. At the same time, if they do too well, they’re probably getting traded — how much mental energy should you invest in a player who won’t be on your team in two months? Did that reliever you like find another gear? Cool, enjoy the two lower-level prospects the team will get back for him in a month. Rooting for a past-their-prime star? Well, if they have a good stretch, the team might ship the one face you remember from the good old days out for some salary relief. There’s one great joy in watching a team that’s in the middle of a rebuild. Whether by accident or design, teams don’t end up trying to retool if they have a ton of solid major league players, which means there’s a playing time void that gets filled by whoever’s available. Minor league free agents and past-their-prime vets? Step right up. Lifetime minor leaguers looking for their first real chance? Someone needs to play third base, so grab a glove. When one of those lottery tickets hits, that feeling makes up for a lot of the bad parts of rebuilding. Here’s a player who has always wanted a chance, and your team gave it to him. If he’s young, he might even be around when the team’s good again, and you, the fan, were there at the beginning. All of this is a roundabout way of saying: Niko Goodrum might be awesome, and the Tigers gave him a chance. If you haven’t heard of Niko Goodrum before, I can’t blame you. He got a cup of coffee with the Twins in 2017 before signing with the Tigers after the Twins released him, and he delivered a solid if uninspiring 2018 (103 wRC+ in 492 PA, 1.1 WAR) while playing across the diamond. He’s been excellent to start this year, putting up a 132 wRC+ with nearly as many walks as strikeouts while batting cleanup and playing both centerfield and first base. Now you, the sophisticated FanGraphs reader, are no dummy. You know that a 132 wRC+ a few weeks into the season isn’t all that outrageous. It’s above average, sure, but no one’s going to lose their mind over it. What makes me so sure Niko Goodrum is amazing all of the sudden? Well, first of all, I’m not sure! When Niko Goodrum started popping up on the various screens I use to look for exciting hitters, I mostly assumed I needed better tests. When I saw he was running a 41.7% line drive rate, I chalked it up to small-sample variance and moved on. If I got excited about every career minor leaguer who walked into a few line drives, I’d be calling for a new breakout every day. Look a little closer, though, and something surprising emerges: Goodrum is excelling in ways that don’t look fluky. It’s early, but I think the Tigers have found something. Let’s start with the basics: Niko Goodrum has shown he can hit the ball hard. He hit 20 balls 105 mph or harder last year, topping out above 110 mph. That’s good territory to be in, especially in only 492 PA — notable names with similar numbers of 105+ mph hits per PA were Matt Carpenter, Jose Ramirez, Kris Bryant, and Miguel Cabrera. That’s important to what we’re talking about here, because if Goodrum didn’t have power to tap into, that would severely limit his upside. For Goodrum to find a new level, something had to change from last year — a 103 wRC+ is totally acceptable for a utility infielder, but that’s not the season you write a story about. Here’s an interesting fact that might not be immediately obvious, though: all that power is to the pull side. 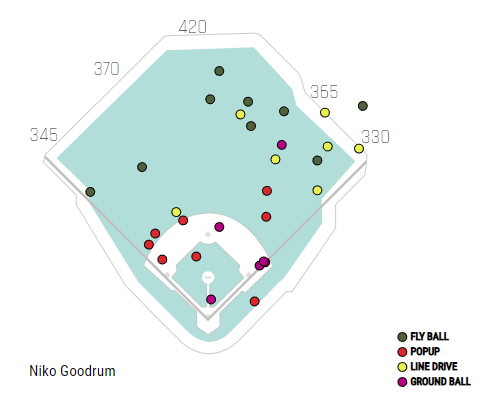 Out of the 20 hardest-hit balls from Goodrum’s 2018, 14 were in the air. Of those fourteen, zero were to the opposite field. He wasn’t using the center of the field, either — I generously counted three as being hit to center, but for the most part his power came at a dead pull. Just to make sure I wasn’t running into an arbitrary-endpoints issue (what if the balls just below 105 mph all went oppo? ), I looked at the 27 air balls Goodrum hit with an exit velocity between 100 and 105 mph. Of those 27, only four were hit opposite field, and all of them were hit while he was batting righty. Given that he’s accumulated all of 6 plate appearances hitting righty this year, I think we’re fine focusing on how he’s done while batting left-handed. Dangit. League average again! For a guy who’s only getting power to the pull side, this isn’t where you want to be. 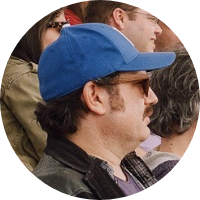 Let me digress for a quick second — let’s talk about the structure of an analytical baseball article. We’ve covered the promise — Niko Goodrum has changed and he’s good now! We’ve covered the problem — he didn’t pull the ball enough before. Now we’re headed to the reveal — pitchers can’t stand this one stupid trick, and Niko Goodrum used it to hit .300 with power and make $57k a month working from home. That’s how these articles work, and this one is no exception. Let’s be more specific than a heatmap, just for completeness’ sake. 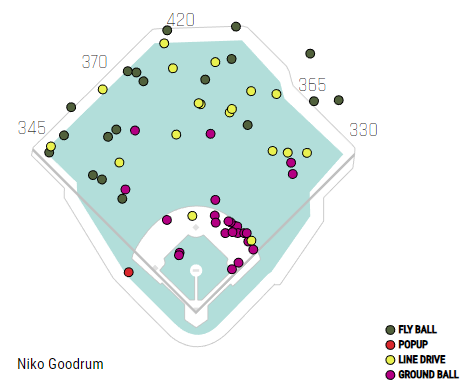 When Goodrum got a pitch on the outer third of the plate in 2018, he swung 71% of the time. In 2019, he’s down to 48%. That 23% reduction in swing rate seems like it has to be purposeful. Just for comparison, his swings at middle and inside pitches have declined by much less, from 75% to 65%. We’re still in small sample territory when slicing up the strike zone this way, but it doesn’t look like a mistake. That, in a nutshell, is all Goodrum needed to do to tap into his pull power. Lay off the outside pitch, and your batted ball distribution changes just like that. Goodrum put twice as many balls into play on outside pitches as inside pitches in 2018. This year, he’s put more into play on inside pitches. 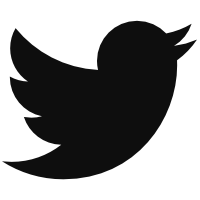 It’s a sea change, and one that, to me at least, screams intentionality. Changing where you swing isn’t as extreme as changing how you swing, but it isn’t something you do idly. It’s also a change that carries some nice ancillary benefits. 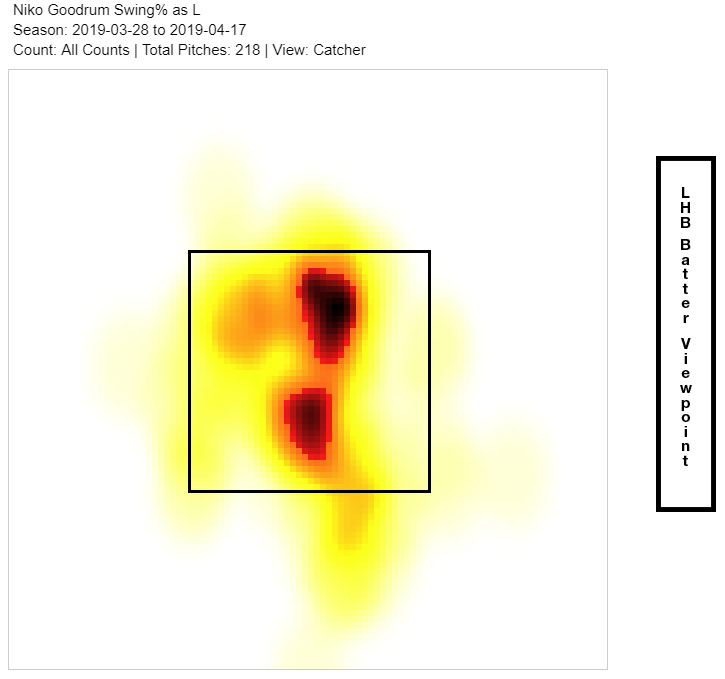 You might have noticed that Goodrum’s swing rate declined both on the outside of the plate and in the strike zone as a whole. I’m speculating here, but it’s easy for me to believe that Goodrum is telling himself to more actively look for a pitch he can pull, which makes him a lot less likely to swing overall. Most pitches, after all, don’t look like a pitch you can pull. A mindset of looking for a particular pitch makes it easier to take anything outside your hot zone, and that shows in his out-of-zone swing rates. 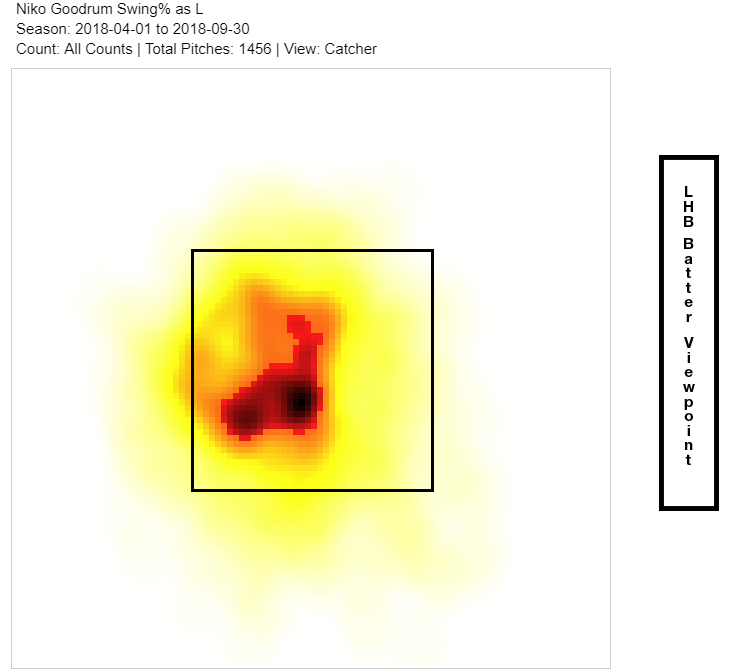 Last season, Goodrum chased pitches outside the strike zone slightly more than average, 33.5%. This season, he’s chasing a sterling 25.2% of the time. That change puts Goodrum in hitter’s counts more often — he’s seeing a higher percentage of 1-0, 2-0, 3-0, and 3-1 counts this year. It’s not rocket science — Goodrum is getting ahead in the count more often, and when he does swing, he’s swinging in an area where he hits the ball harder. That’s how you build a breakout. Every argument I’ve presented for Goodrum comes with a caveat. It’s a small sample; he’s only putting up a 132 wRC+ right now; he’s a longtime minor leaguer who the Twins just outright cut as recently as 2017. That’s all true! I’m not here to deny any of those facts. There’s another way to look at the narrative, though. A big, toolsy (he has a faster sprint speed than Mike Trout this year) former second rounder found a way to tap into his natural power. It was always there, lurking just below the surface; he just needed to change his swing thoughts to unlock it. Maybe, in a year, we’ll see that Goodrum was just a flash in the pan. Maybe pitchers will adjust. Maybe it’s all just noise and nothing has changed. I don’t think so, though. I look at him and I see a chance that we’re looking at the next Jose Bautista, only one who can play centerfield and second base with equal aplomb. The Tigers aren’t great this year, and they probably won’t be great next year. They might, just might, have found a guy who will be on the next good Tigers team, though. As a Tigers fan, that’s something to look forward to. Ben Lindbergh and Sam Miller banter about Johnny Cooney as the Vroom Vroom Guy, minor-league closer Dusten Knight’s backflip save-celebration ritual, the extreme struggles of the Red Sox, and a new way to represent Willians Astudillo’s success at making contact, then answer listener emails about umpires calling balls and strikes from second base and the most commonly known things about baseball, plus a Stat Blast about the disappearance of old pitchers. Audio intro: The Undertones, "Jump Boys"
Audio outro: The Capes, "First Base"